The Asociación de Comerciantes, Artesanos y Profesionales de La Herradura (ACAP-LH) has put its Christmas-shopping promotional efforts into gear. One of the ideas to give local businesses a boost is that local shops will give raffle tickets to customers who make purchases superior to 15 euros. The raffle will provide the lucky winner with a 500-euro voucher to spend in local shops. 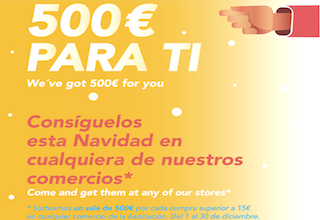 This initiative blasted off on the 1st of this month and will last the whole month, so if you would like to have the chance of an extra 500 euros to spend this Christmas, so now you know! This entry was posted on Thursday, December 6th, 2018 at 12:55 pm	and is filed under La Herradura. You can follow any responses to this entry through the RSS 2.0 feed.